I need some assistance. 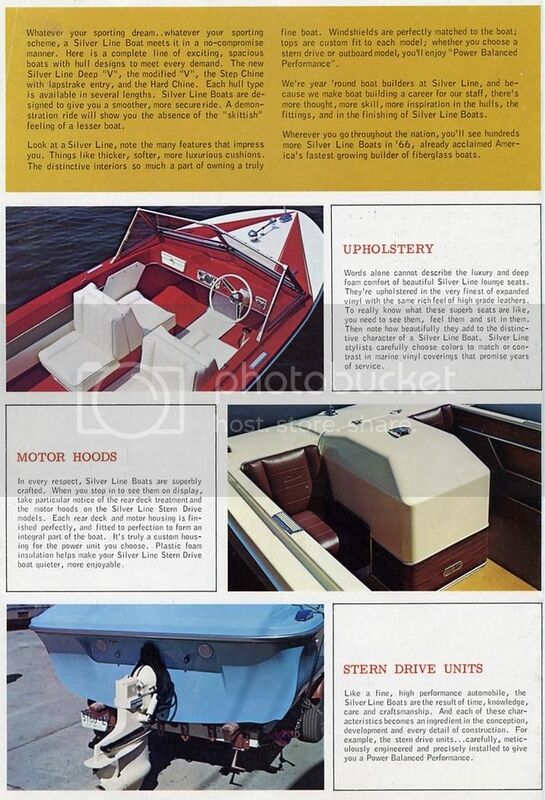 I have a 1967 Silverline 17' that my grandfather purchased brand new in 1966. It has I/O with a 4cyl Ford and I assume the sterndrive is a pre Alpha mercruiser but I do not know for sure. 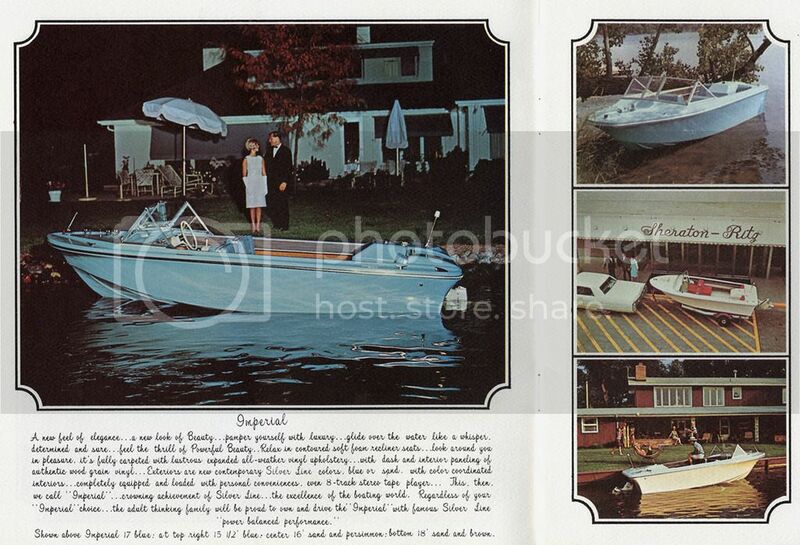 It has a few unique items that I cannot find on any pictures except for the 1967 Silverline product brochure. This boat was used in Salt Water for approximately 3 years. The exterior and interior have been completely restored and when disassembled the engine was running great. Always did run great. The complete sterndrive is removed from the boat and I was told it needed seals because there was water in the oil. We cannot get it apart, and I've taken it to three reputable boat shops and they wont touch it. They say its ruined and needs to be replaced. The drive shaft will not turn and it appears the gears are locked up. First i would like some help identifying the sterndrive. Second, i would like to know how any of you experts would proceed with this build. Third, i would like to know what this boat is worth if I sold it as it is now. I am not a very sentimental person, so I have no attachment to the boat. Any advice or info is very much appreciated. The Alpha One name wasn't used until the 1986 model year. However, the drive was actually released a few years earlier with the designator "MR" drive. In my opinion, MerCruiser waited until OMC finished introducing their new OMC Cobra Stern Drive in 1985 to then introduce their "new" Alpha One stern drive that has been quietly introduced in 1983 as the "MR"
You DO NOT have a Ford engine. That will be a MerCruiser 110 or 120 HP 4 cylinder GM 153 CID. The drive will be a MerCruiser 1A, 1B or 1C depending on gear ratio. Last year used was the 1966 model year but I'm sure some left over engines showed up in 1967 model boats until the supply was exhausted. Most dealers won't work on the old stuff because some parts are hard to find, some special tooling is no longer available, newer dealers won't have the service manuals or the tooling, their mechanics aren't familiar with the old drives & quite simply, it will most likely cost more than it's worth to repair. Anyway, by asking around I found several marine repair shops willing to work on my old sterndrive. In fact the first one was given to me by the local Sea Ray dealer who, of course wouldn't touch it, but knew who would. So it might help if you just ask around. Plus that if you have a shop near you that specializes in Mercury Engines (fortunately there is one near me)they can usually point you to a good source. I haven't had to replace an parts except the impeller and the bellows and gaskets, all of which are readily available. However internal parts may be harder to get. Buying another sterndrive unit and stripping it may be the best way to get spare parts, of course assuming they are in good condition. As far as the engine goes you can get parts on the internet. Iboats.com is a good source. GO2Marine.com has an engine parts finder and I have gotten parts from them. The toughest was finding a new manifold. If you need it I can dig out where I bought it. But the point is if you do some serious searching on the internet you can find what you need. I may not be original equipment but there are a lot of perfectly good substitutes available. That is a early I drive with optional power trim, a very difficult drive to find bits for these days. Your best bet as stated before is to find a later model engine and drive and swap them over, much less hassle and cost than trying to find bits for the one you have. Looks like yoke u-joint shaft may be rusted/corroded to the gimbal bearing or the outdrive is corroded a bit where it goes into the gimbal housing whole. It's a close fit. Take a look at "marineegine.com. 120 GM 153 I / L4 1964-1972. 2 diagrams to look at. #32 yoke u-joint and #12 gimbal bearing. Probably a two person job. Hope this helps you. Did the engine rotate before you removed the outdrive or was it unable to crank? Looks like this might be the stuff you need. Saw on Pittsburgh Craigslist (Moon Twp is near Pittsburgh PA airport. If it is correct, the price certainly seems right!